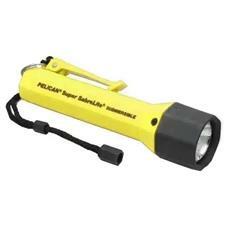 This powerful flashlight was designed with one thing in mind: SAFETY. It carries more approvals than any other flashlight on the market today, making it safe for any hazardous environment or condition. The SabreLite is o-ring sealed with a twist-on shroud and comes with a polarity battery guard tray that s afeguards against dangerous "outgassing" of hydrogen from an accidentally reversed cell. It is powered by 3 C alkaline cells, submersible to 500 feet, and has an ABS resin body which resists chemicals, corrosion, and extreme temperatures. Unlike ordinary flashlights that produce a yellow beam, the SabreLite's incredibly bright Xenon lamp produces a powerful collimated white beam. Pelican's SabreLite is the leader in quality and performance.